Natural Image Hair Group experts are trained in Trichology, the science used to identify and treat scalp afflictions. In order to build a treatment plan adapted to your hair condition, our trichologists will begin by analyzing your scalp using a computerized micro-camera and will complete with you a comprehensive form. What is Trichology? To have healthy hair you need to have a healthy scalp. You can’t have healthy hair if your scalp isn’t healthy. The scalp is actually a skin base from where your hair follicles grow. When an affliction is present the treatment should be in the realm of dermatology and trichology, rather than hair styling products, which in turn, are aimed at the health of the hair shaft. Therefore, trichology is the science at the crossroads of dermatology and cosmetology that aims to bring back the hair cycle to its normal state. This is why at Natural Image Hair Group, our specialists are trained in trichology. We start from the root of the problem. After an analysis of your scalp, we will recommend a program specifically designed to restore the balance of your scalp, combining home care treatments with in-depth salon treatments. 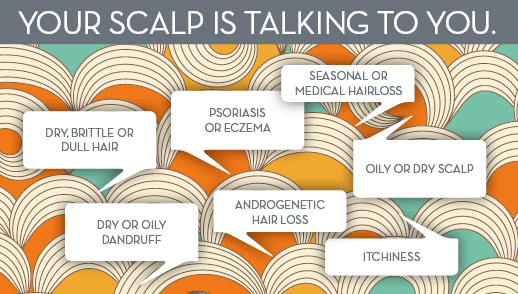 What Are The Most Common Scalp afflictions? It is possible to stabilize and/or delay hair thinning and manage scalp afflictions. Our “Head First” Hair Loss Prevention & Scalp Health Program is based on the science of Trichology (the science of scalp afflictions) and on our 3-step personalized treatment plan can help you with your specific scalp condition. Using a state-of-the-art technology, we will perform a complete hair and scalp assessment and an analysis of your scalp using a sophisticated microcamera and a unique software, in order to identify the cause of your affliction or hair loss. Now you can do something about hair loss and scalp problems. Whether you are just starting to experience the effects of thinning hair or are in the most advanced stages of hair loss, our trained professionals can help with our full spectrum of professional hair restoration options. We provide our clients with individually customized hair restoration solutions that are so incredibly natural that there is simply no reason to suffer from hair loss or baldness, any longer.